TRESCOM: Hello Wajas. First of all, how old are you? And how many years of your life have you spent on Trespasser so far? WAJAS: I’m 17 (hehe, my birthday was on Sunday, so that’s kinda recent). I bought Trespasser back in early 1999, so I was how old? About 14 then. Ah those were the days… Seems rather sad that I still go on about the same game all these years later but it’s a testament to its enduring ability to impress. TRESCOM: Ohh, I didn’t know that, congratulations, btw 🙂 Anyways, do you happen to have a job? If so then which one is it? TRESCOM: well anyways shall we move on? TRESCOM: btw, you’re quite fast at eating,eh? you’Re gonna like the next question: what is in your refrigerator? WAJAS: hmm good question…lots of stuff, mostly random, but the usual stuff too, milk, yoghurts, ham, eggs, diet coke etc. nothing particulaly Trespasser related! TRESCOM: Well and if you had one wish, what would you waste, err spend it on? WAJAS: that’s a remarkably hard question to answer. one wish… oh cripes. WAJAS: well there’s that girl who lives down the road and I’d…..oh wait maybe not. Bit a waste no? WAJAS: umm, yeah, with my help all people groovy hat on I’d say like world peace type malarky but with specially for me, I’m a selfish git hat on, probably the other one. How sad. TRESCOM: So what would you say is the most important thing in your life? the girl down the street? TRESCOM: lol… I think we’re switching themes here all the time, eh? how about switching back to trespasser? TRESCOM: First of all, when did you buy Trespasser and why were you interested in it? WAJAS: As I said, I brought Trespasser in spring 99. I was first interested in it because I loved Jurassic Park and during my general web trawling I came across it. Read some reviews, some good, some bad, but was intrigued by the premise so decided I’d make my own mind up and bought it. TRESCOM: Uhuh… and after you’ve finished it, what have you been missing most? WAJAS: probably the feeling of not knowing what was next, of the mystery and excitement one felt exploring Site B…one of the game’s best points is its evocative creation of the Lost World. TRESCOM: seems like you are a trespasser fanatic, eh? WAJAS: I guess, though I really don’t play the game at all any more. It doesn’t really work properly on my computer now I’ve upgraded. But I still follow the community and the RE efforts with interest. WAJAS: yeah yeah not any time soon. 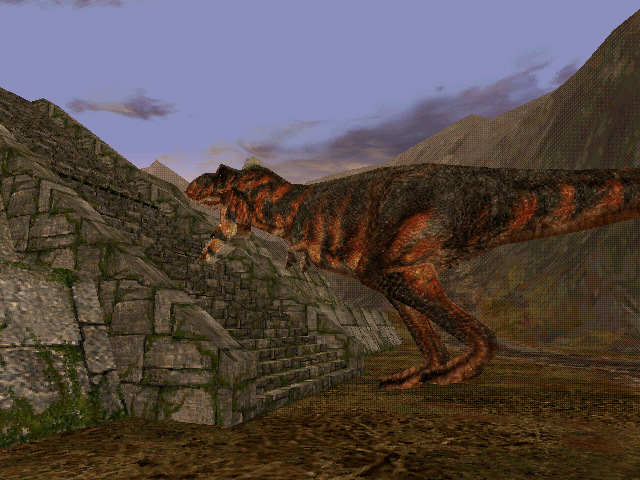 TRESCOM: However, do you have like a certain level/ gun or dinosaur you like most in the game? WAJAS: My favourite levels are the Town and the Lab, love exploring. Favourite dino? Hmm, not sure, the raptors always used to scare me, but I thought the T-Rex was quite funnny…I’d say the brachs really. Guns wise I quite like the SPAS-12 for sheer power. Makes a cool sound too. TRESCOM: Yeah it does… Now I want you to do me a little favor and think about yourself being lost on an island somewhere in the pacific. You do have a computer and you could have rescued 3 games… which would they be? TRESCOM: lol… well the last standard question I’d like to ask you is: What are your plans for the future? Wanna stick arround in the game industry? WAJAS: no I somehow doubt I’ll end up in games…next year I finish school and I imagine I’ll take a year off before going to university where perhaps I’d like to study Classics….then who knows? TRESCOM: Your site has been running very well over a long period of time now and you even managed to get into touch with ab actual Dreamworks Interactive PRogrammer (rich Wyckoff). How did you do all that? You didn’t use any magic-spells, right? TRESCOM: But anyways, you must have done something , right? wanna tell us or is it a secret? Did you sell your soul? WAJAS: it is a secret I will take to my grave….dark rituals and teh like…BWAHAHA…ahem. TRESCOM: So back to your site, was it very tough to get it up running? And what was like your main idea behind it? WAJAS: not really to get it started…les so to actually keep it updated once in a blue-moon. Even in teh current rollorcoaster ways of the community news ain’t coming thick and fast, and I have lots of work Main idea? Like tres…wanted to do some webdesign…there you go! TRESCOM: So you’d say that it would be an easy way of helping the community? Maybe just to pick a topic about Trespasser and create a website arround it? I guess you know where Im going with these questions, eh? WAJAS: Umm, I’m not sure creating a website is necessarily the best way of contributing to the community though of course I welcome any that do come. I just think, speaking from experience, there’s not very much original Trespasser content out there, so we really might as well pool our resources so to speak. but I don’t mind. It’s good to see others expressing themselves. TRESCOM: Yeah, that’s what I’ve been thinking.. so what would you say would be an easy way of contributing something to the community? WAJAS: I think so! everyone has a contribution, even if that is only supporting everyone else! TRESCOM: Alright, may I ask you a final question? TRESCOM: Ahh there is that shoot again, eh? TRESCOM: Well, anyways, what do you think is the future of Trespasser? WAJAS: something no-one can really say. hopefully with the ever-evolving TresEd, the community will become more active again, and hopefully we’ll have some real progress on making Trespasser closer to its dream as well as new levels! My dream is to create new higher-quality graphics etc within a game world removed of mistakes and other problems. That would be nice. So I think the future of trespasser is bright, and i think its eventual influence is likewise very bright…who knows what games in the future will emulate Trespasser?